The Body Reset diet has been creating a lot of buzz since the book came out, with Kim Kardashian and Megan Fox among its celebrity following so when I was asked to review it, I jumped at the chance. The review will be practical – I’ll be doing the Body Reset Diet and giving a daily update through The Body Reset Dairies starting tomorrow. 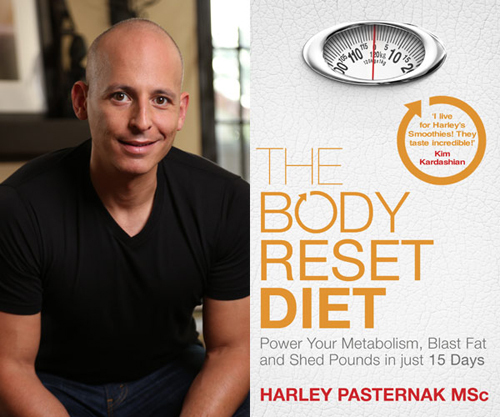 The Body Reset diet was created by Harley Pasternak, who’s quite popular in the weightloss and dieting circles; he also wrote The 5-Factor Diet. The Body Reset Diet is made up of three phases, each lasting five days. In all three phases, dieters will eat five times a day to help boost their metabolism and trigger weight loss. This phase lasts for five days; during day 1-5, dieters will be drinking three smoothies a day and eating two snacks and walk a minimum of 10,000 steps. Phase two also lasts five days, dieters will be drinking two smoothies and one solid – nonblended meal. In terms of movement there’s still the minimum of 10,000 steps as well as a 5 minute at home fitness routine three days a week to tone the body. This phase comprises of just on smoothie a day, two meals and two snacks. Physical activity in this phase is still 10,000 steps as well as two five minute circuits of resistance training five days a week. After the 15 days, to maintain the weight loss achieved, dieters can have one smoothie, two snacks and two solid meals. Twice a week, they can enjoy ‘free meals’. And for physical activity, it is still 10,000 steps a day in addition to the 10 minute resistance circuits introduced in the previous two phases. The science behind the Body reset diet plan makes sense, after all we all know the importance of fruit and veg not just for losing weight but for general wellbeing and what creator Pasternak is proposing is like a body detox for 15 days that will set your body up for better health and weightloss so it’s time to put it to the test. The diet seems simple enough and considering it is just for 15days, It’s certainly doable. The Body Reset Diaries aim to find out if the Body Reset Diet actually works. Is it possible to survive on smoothies for five days? Will there be significant weightloss? Are smoothies alone enough to keep hunger away? Pasternak proposes minimal exercise, is it enough to achieve weightloss? All these questions and more will be answered in the daily chronicles of The Body Reset Diaries. Everything you need for a fantastic free from Christmas.